People across the world have immense love for these giant animals and Keralities stand a couple of steps ahead in showing the love for the animal. Along with a large population of wild elephants, Kerala has more than five hundred and fifty domesticated elephants at present, which are mostly owned by temples and individuals. It is also the state animal, with being featured in the state emblem, adopted from the erstwhile Royal Arms of Travancore and Cochin. Almost till the 19th Century, having a pet elephant was considered a prestige for Keralites. It was more like owning a BMW/Audi or a Rolls Royce for that matter. The prestige of the family was measured by the number of elephants they used to own. 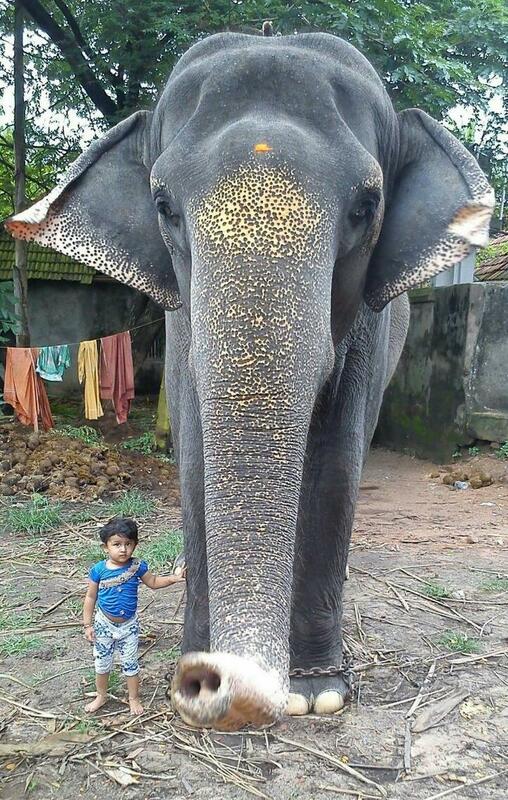 The tradition and culture of Kerala and its relation to use elephants in temple processions date back to centuries. There’s not a single festival to be seen in God’s own country which doesn’t have an elephant procession or participation. 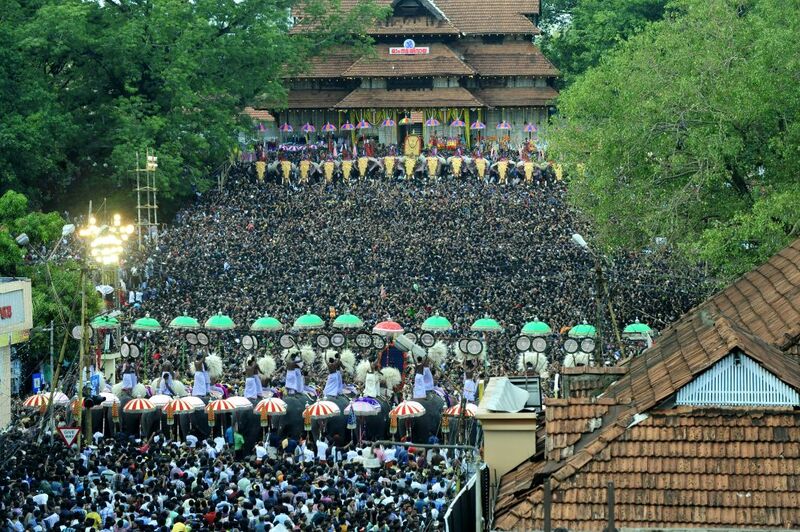 According to recorded facts and figures, even from 1436 elephants were used in Arattupuzha Pooram. 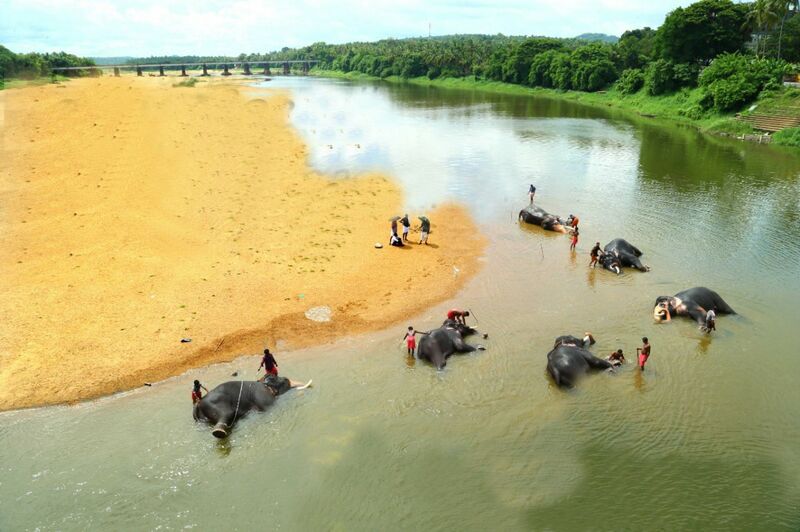 Those who reside on the banks of Bharathapuzha towards the northern Kerala used to assemble for the Arattupuzha Pooram taking the elephants along with them. It is in this time that during the reign of Shakthan Thampuran, the much-famed Thrissur Pooram has started some 200 years ago. 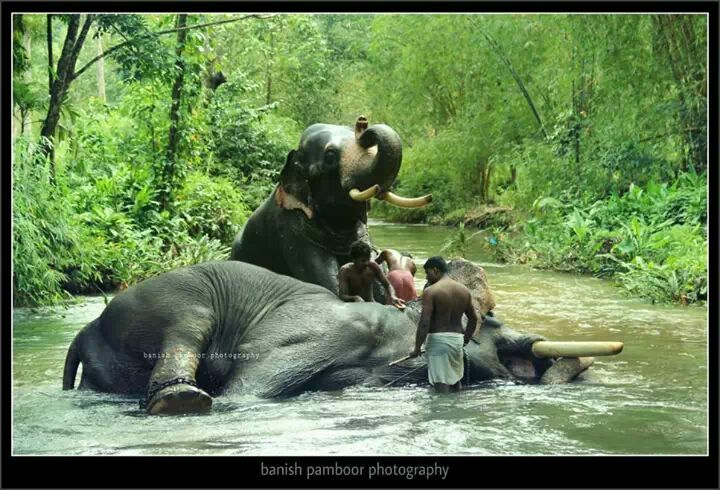 “Kerala boasts the most number of domesticated tuskers in the world. It is only because of the care and attention given to them that we could achieve this goal,” says Sasi, State General Secretary of Elephant Owner’s Association. Most of the religious festivals in Kerala features a richly decorated, caparisoned elephant, which carries the deity during the festival and take part in the processions or ceremonial Circumambulation in temples and churches. The elephants are usually decorated with gold-plated caparisons (Nettipattam), bells and necklaces in mid-scale festivals. At the same time, these elephants will have two people holding silk parasols (muthukuda), white turfs (venchamaram) and peacock feather fans (alavattom) in celebrated poorams or processions. The immensely decorated elephants are a feast for the eyes. 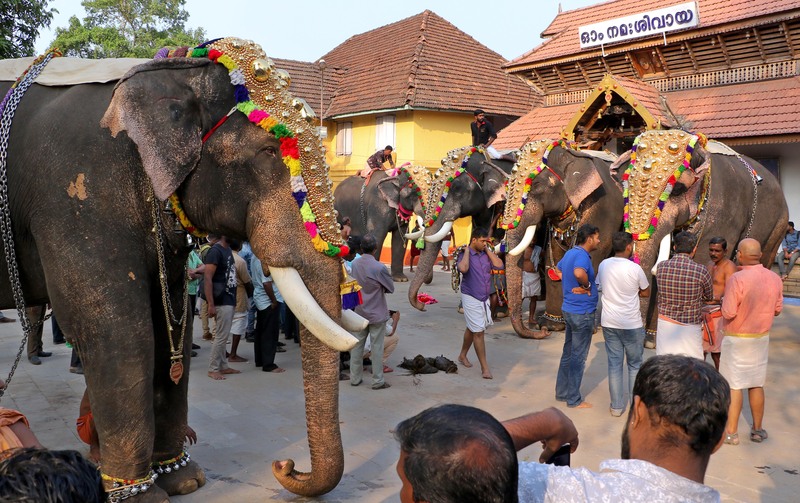 In Arattupuzha and Thrissur, sometimes close to 100 elephants take part in the processions. The celebrity elephants, which meets the criteria prescribed – such as the height of the tusker, the colour of the eyes, length of the trunk, size of the tail, colour of the nail, forehead bump- has fan clubs across the state. 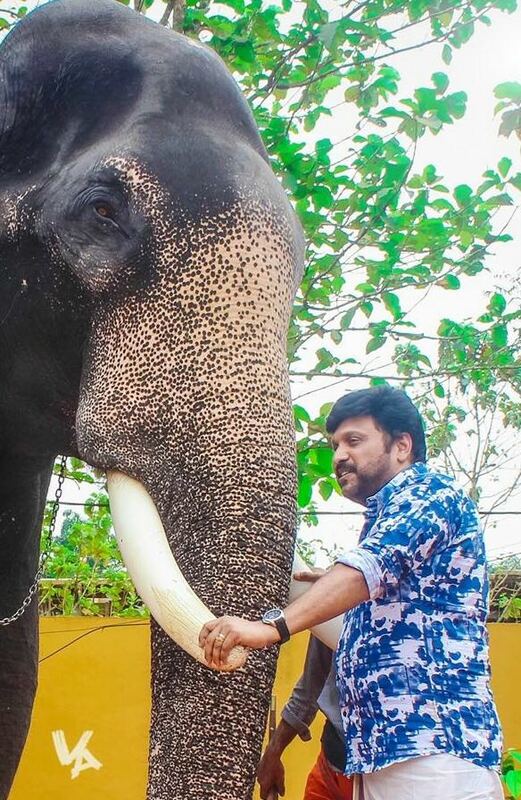 Rejith, the Pathanathitta District Secretary of Elephant Owner’s Association, feels that patronizing the elephants just like the star celebrities in movies is one thing which needs to be avoided. “The tuskers should be considered so, not to be treated as human superstars,” says Rejith who owns the 38-year-old Omallur Govindankutty. A major concern regarding the festivals and elephant processions is the number of accidents reported because of the upset pachyderms. “There are around 550 elephants in the state. And, if we consider that one elephant attends 80 festivals at the maximum in a year, there are about 40,000 such festivals. And it is only in 5-10 places that the elephants create issues,” adds Sasi, the proud owner of owns 35-year-old Parthasarathy. Considering the road accidents reported in Kerala, this seems to be a very minute number. There are also a number of train accidents reported in the state, killing tuskers. Trains now kill 17 elephants every year on average in India. Sasi feels that it is with vested interest that the people voice against the use of elephants in temple processions. He strongly believes that it is an indirect attack on the culture and tradition of the state. 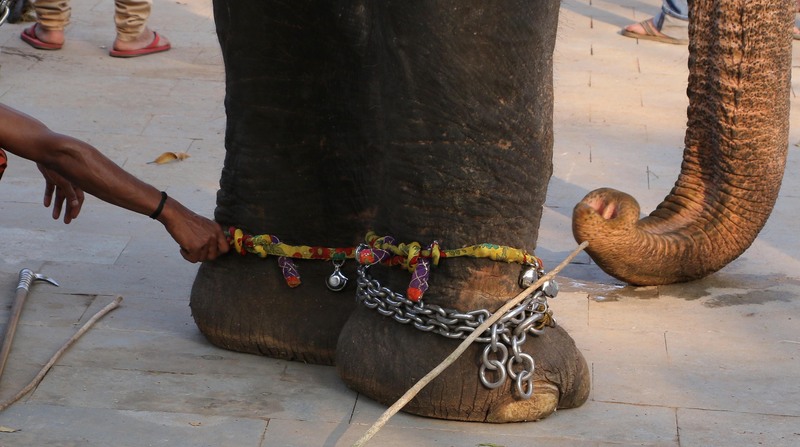 The Government of India has banned captivating elephants in 1970s. Now, only the injured wild elephants and infants being singled out from the herds are being rescued, treated and domesticated. There are strict prohibitions in importing the animal from the other states too. “This simply means that majority of the tuskers and other domesticated elephants in the state are above 40 years or so. There are not enough elephants to attend the festivals and social functions in Kerala. 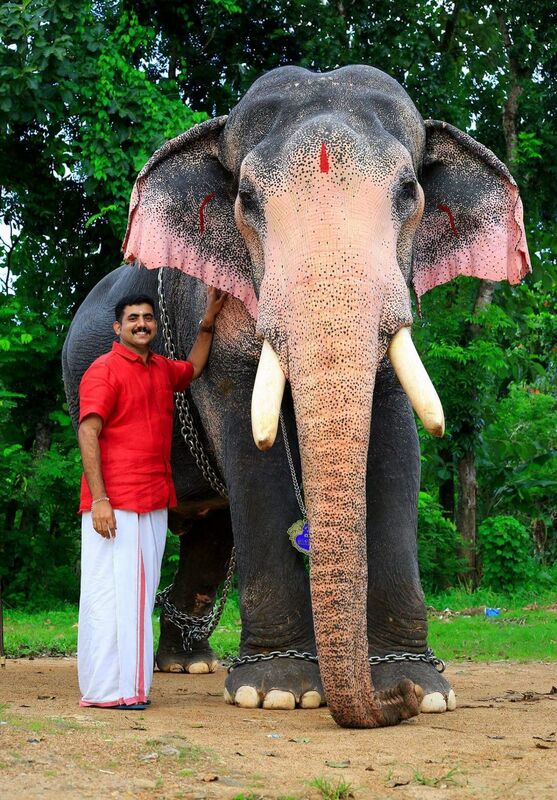 Since the number of elephants is low, it is a bit difficult to manage attend the festivals,” says Rejith. Dr. Girish also seconds the view of Rejith saying almost 70 per cent of the elephants are above 40 years old. But, he feels that there should be a limit to the number of festivals one elephant is attending in a year. The veterinary doctor opines that it would be better to limit the number to 50. Though reports say that a single event would easily fetch Rs 2-3 lakh for the elephants, Sasi says it is not as rosy as it seems. Only the celebrity tuskers would get lakhs for a single appearance where as the medium elephants would get just 15,000 for a single appearance. And, on special occasions and festivals, the elephants will get nearly 25,000 for a single appearance. There are basically three mahouts for a single elephant. The first/main mahout will have to be paid Rs 10,000 to 12,000, whereas the second mahout to be paid between Rs 9000 and 11,000. The third mahout will receive anywhere between Rs 7,500 and 9000. Other than the salary, the mahouts will be getting festival allowances and daily allowance. A single piece of patta (the main menu in the elephant diet) costs anywhere between Rs 100 and Rs 110. On a single day, an elephant owner spends almost Rs 2500 for patta alone. Considering the other food items, on an average a single elephant needs atleast Rs 5,000. 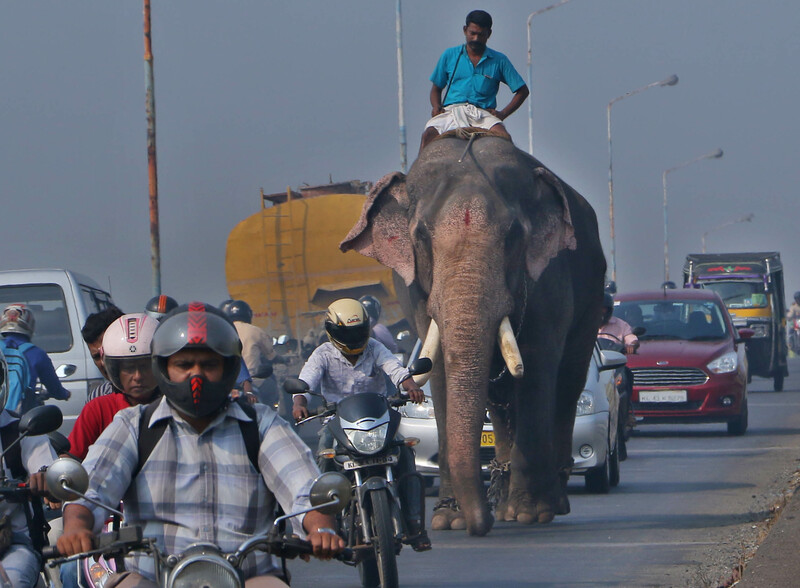 The insurance amount for a pachyderm is anywhere between Rs 5 lakh and Rs 10 lakh. But, Sasi says it requires atleast Rs 2 lakhs to bury the body as per the rules, if the animal dies. “The tusk, which used to be handed over to the owners during the earlier times, are now being kept with the forest department,” Sasi explains. Most of the male elephants have musth period during monsoon season (Falls in the Malayalam month Karkkidakom) from June to October. The musth period, a condition of elephants characterized by highly aggressive behavior, accompanied by a large rise in reproductive hormones, lasts 3 to 4 months for an elephant. The elephants are given special care and attention before the musth period and are given Sukha Chikitsa during the time. “The elephants are engaged only between Vrishchikam 1 (Falls on November-December) and mid- Medam (April-May), the time period which has maximum number of festivals in Kerala. 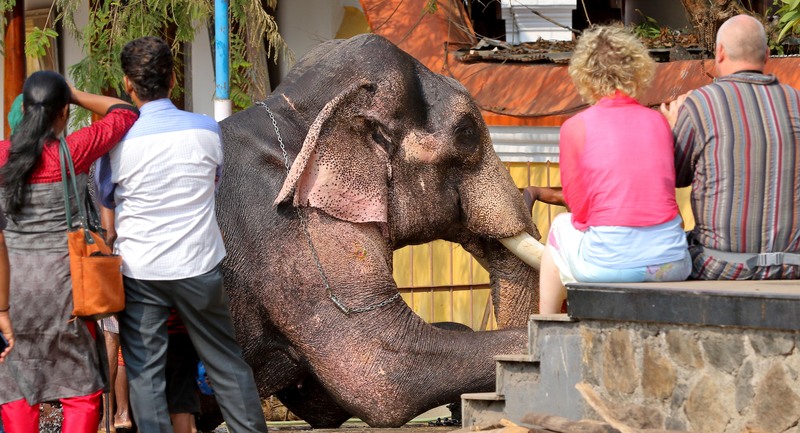 The rest of the time the elephant is being take care of by the owners,” says Sasi. Flattened rice (Aval) and small bananas along with medicines to treat worm infections will be given to the elephants early in the morning followed by coconut toddy and fried rice powder. The elephant will also be fed a kilogram of seedless dates paste (grinded and mixed with ghee) to cleanse the system and for proper blood circulation. Rejith spends Rs 1.50 to 2 lakhs for the treatment of the elephant during the musth period. Dr Girish, who is not that happy about the traditional methods and the common practices of treatments at present, says that it is high time that the Elephant Owners form a group or platform wherein doctors would be able to discuss a particular case and give proper, effective care to the animals. However, the doctor feels that the owner’s ego doesn’t allow others to know that his elephant is ill, and since they refrain from such open discussions which would be very helpful in getting expert opinion. There’s a monitory committee chaired by the respective district collectors to look after the pachyderms. There’s also a district level task force and a State level elephant task force to monitor the activities of the owners and keep a check on the elephants. Dr Girish feels that there’s an urgent need to address the ‘Erandakettu’ disease (impaction of colon) widely seen in the domesticated elephants in the state. “If the elephants are given equal quantity of grass to match with the acidic palm leaves, we can curb the disease to a large extent,” says Dr Girish. The forest department, earlier in 2011, has planned to introduce dietary changes for the animals to bring them closer to natural food. A pilot project for correcting their food and nutritional content was also announced at Guruvayur Devaswom. They are traditionally fed palm leaves, Careota or coconut. Elephants are primarily grazers and feed mostly on grasses and bamboo leaves. In the wild, they feed on more than 50 species of plants. “It might be only there in Kerala that captive elephants are suffering from impaction of the colon due to eating palm leaves. The ailment is resulting in their premature death,” says a concerned Dr Girish. He urges the elephant owners that there needs to be a change in management and a change in the cuisine of this great animal. In India, and especially in Kerala, the mahout are well-trained and they have limited use of weapons to tame the elephants compared to the dangerous and fatal instruments used by the foreigners. “There’s only a mere 3-5 per cent of owners and mahouts who ill treats the animal, which is not at all a matter to generalize the entire group,” says Dr Girish. The doctor also feels that the activists are not ready to bank on the doctors. He also points out that the size of the animal should be accounted for when we talk about the wounds. “What seems to be gig for a human, need not be that huge for a giant animal,” he reminds. In fact, Kerala is the only state which follows the strict laws and is the first state in India to come up such laws in favour of the pachyderms. 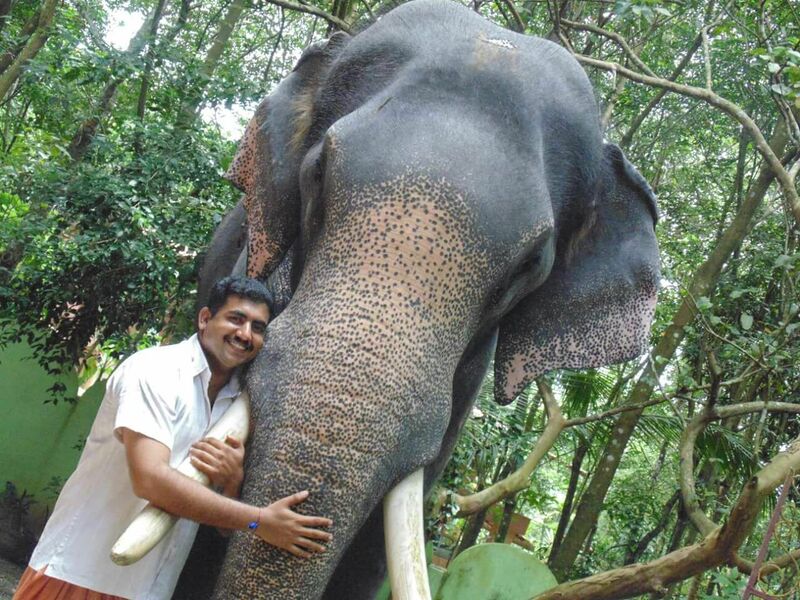 As Rejith and Sasi point out, the Elephant Owners in Kerala are the best in keeping their animals in good shape and take proper care about the health of the elephants. 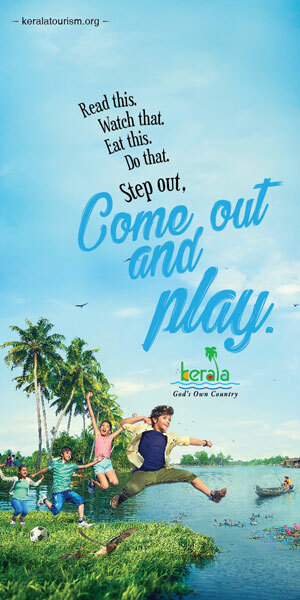 Though they accept the fact there is a small number who violates the rules, both of them says that the big giants are more like their own babies and is not a business for Keralites. While inspecting the premises by a Range Officer prior to festival he shall make sure that arrangements are here for sufficient space, water, fodder, shade, distance to the location of fire work and that the festival organizers have arranged elephant squad for inspecting and veterinary care including tranquilization facilities to the elephants if the number of elephants to be used are more than 3. He shall obtain an undertaking from the organizers that they will observe all the regulations stipulated in the various Acts, Rules and directions during the time the entire period of the festival. A schedule of time of the various involving elephants may also be attached to the undertaking. The veterinarian issuing the health certificate shall verify and record the correctness of all the registers stipulated in the 2003 rules, ownership and microchip certificate in the health certificate. Kodanad, known for its ‘Elephant Kraal’, is the only elephant rescue and training center in Kerala specialized for rescuing and training stranded adult and baby elephants from the forest regions across Kerala. The Kodanad Elephant Training Centre, which is now moved to Abhayaranyam near Kaprikkad, is one of the largest elephant training centres in Kerala near the southern banks of the Periyar River. Since the ban on capturing elephants was enforced, this place now serves as one of the premier elephant training centres in Kerala. Muthanga of Wayanad and Konni of Pathanamthitta are two other elephant training centres. It is also to be noted that Kerala is the only place in the whole world which has a special palace dedicated for elephants. The one and only elephant palace is located at Punnattur Kotta, just 3 kms away from Guruvayoor temple, which owns the most number of elephants in the state. If you are in Kerala, make sure you visit one of the elephant centres to get to know the royal treatment, care and affection they are receiving. It is surely every elephant lover’s paradise to view these magnificent beings up close. 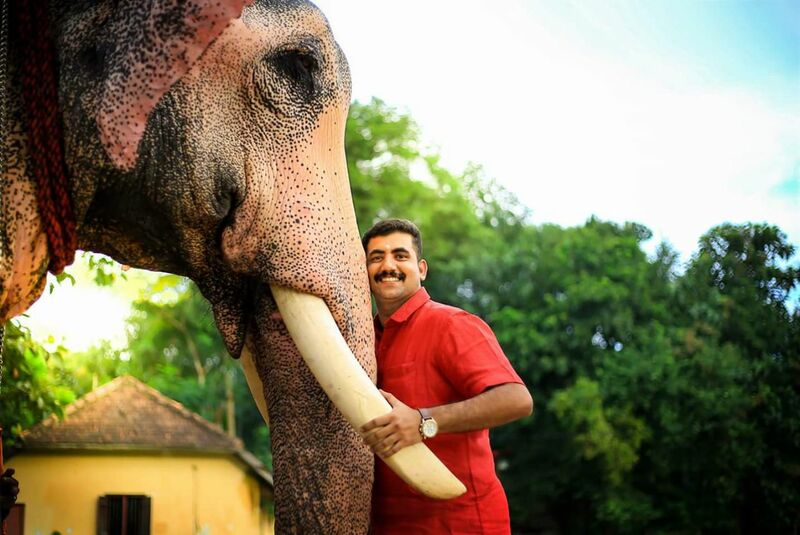 For an outsider it is hard to fathom the bond between a Keralite and the elephant. The tuskers are considered emissaries to God, with almost all temple festivals is considered incomplete without the presence of caparisoned elephants.